with anything in the classroom, and I’ve learned that it can always be improved! left side. I just don’t want to force a left side when I don’t need it or when we don’t have time for it or when it really isn’t necessary. But sometimes, it IS necessary. easily cause problems in the future. And when it comes to collecting the notebooks and grading everything on that left side – well, ain’t nobody got time for that! notebooks and making them even MORE useful! crossing out and drawing arrows all over the place) and it is accurate! their interactive notebooks without any hassle or haggling with the copy lady. very simplified. Students are applying these words to a story we read. it, and voila! Even MORE independence! 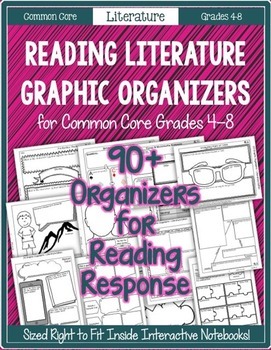 pages from the graphic organizer pack! – here’s the Story Vocabulary organizer. Grab it by clicking it below. response to literature question and – you know it – an example on the left! the notebook lessons when applicable. I use both left and right sides for foldables and such. Just figured that would be the best use of the comp book. What is your reasoning for mostly just using the right side? This is timely as we were just about to put the story vocabulary activity in our notebooks, but I, like Diane R, use all pages of the comp book and do not skip the left side. I have purchased your graphic organizers and plan on taking your advice and adding a guided model to our notebooks, so that they will always have that reference, but as Diane, I don't think I am very clear as to the reason you skip the left side.I just add one activity after another. What am I missing? Aww man, my timing is just a little bit off. Erin, I started doing story vocabulary two weeks ago, I and I did the EXACT SAME THING YOU DID in your student's notebook picture, except mine did not have a cool printed out graphic organizer. It was funny because I went back last year and put post-it notes on all my ISN activities from you and wrote down what worked and what did not for my kids. (Honestly everything did except for that tricky to cut Little Red riding hood activity and the tricky to fold character foldable.) Then I figured I'd just make a few small adjustments and we read a story in our (YAY!) brand new Common Core textbook that went right with your lesson. So instead of the picture of the woods, our class did the same thing. I just wish I had your graphic organizer. In any case, I'm looking forward to getting your bundle from TPT. I love everything you come out with and love that you're with us on re-thinking and re-organizing from year to year. Will you be making similar "add on's" for your other interactive notebooks? My kids are LOVING them !! I have a question for you, and I know this is probably a really dumb question, but…on your evidence-based response (which I love, btw) do you have the kids come up with the questions? Or do you give them the questions? Thank you for this blog! I found you through a pin and I cant get enough! I am new to the middle school world and through your blog I have learned that I am using my interactive notebook all wrong! I am so inspired to turn my notebooks into the truly interactive, no warm-up, learning tool I need in my class! Thank you, thank you, thank you!! !